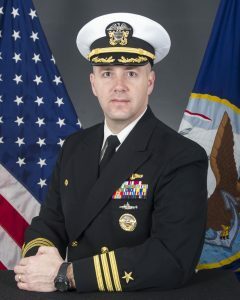 The Commanding officer of the future USS MONTANA will visit communities across Montana in September. Commander Michael Delaney will be in Billings, Helena, Great Falls, and Missoula September 20-23. With him will be crew member Electronics Technician Second Class (Nuclear) Evan Glenn., a graduate of Bozeman High School. At each location CMDR Delaney will provide an update on the construction and capabilities of the warship that will bear our state’s name. He will also talk about the crew that is coming together — with a number of members who have Montana connections. A highlight of the visit will be introduction of CMDR Delaney and ETN2 Glenn at a home game of the University of Montana Grizzly football team. Thursday, September 20 – Billings for an evening public reception event cosponsored by area Rotary Clubs. Saturday, September 22 – Missoula for an afternoon UM football game introduction and evening public event sponsored by the Western Montana Military Officers Association. Please watch for details on how to reserve a place for one of the public events.